British cartoonist and illustrator, Tom Gauld is the author of the graphic novels Goliath, Mooncop and You’re All Just Jealous of My Jetpack. 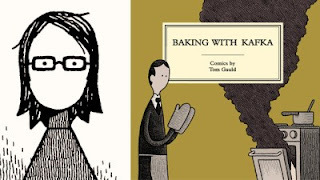 Baking with Kafka is his recent collection of short comics, many of which have already been published in The Guardian, New Scientist and The New York Times. Gauld’s drawings are simple, yet perfectly executed, without any superfluous detail. His short strips (1 to 8 panels) are usually funny, but above all, they’re smart and insightful. The high-brow mention of Kafka in the title might seem ironic to more than a few people, particularly when it’s combined with baking, and the fact that only three strips in the collection relate to the Czech author. The Kafka reference may have to do with Gauld’s reliance on absurdity to get a laugh. Just imagine a comic strip in which two books are lamenting about their adaptations. One book confesses that his book was made into a German TV movie starring David Hasselhoff. Not to be outdone, the other book declares that his adaptation is far worse—the film, the review states, is a masterpiece and surpasses the source material. The dominant theme throughout Baking with Kafka is books, not just the nerve-racking writing process, or a writer’s doomed attempt at creating something truly original, but also what happens once the book has been written. In one strip, Gauld serves up aptly named authors’ cocktails: the Rejected Manuscript, the Meddling Publisher, the Dreadful Review, and finally, the Disappointing Sales Figures. Gauld also reconstructs classics, adding forgotten chapters to Jane Austen’s Emma and unveiling previously unknown final chapters of Charlie and the Chocolate Factory. There’s also his classic literature with added science: Lady Chatterley’s Lepidopterist, and Sense and Seismology. Among my favourite strips in this collection are when Gauld combines literary creation with new technology. Consider some of these murder methods for modern mystery writers: run over by a self-driving car, an exploding e-cigarette, strangled with a smartphone charger cable or pushed off a cliff while instagramming. Gauld also delivers a few keyboard shortcuts for novelists that include combinations to find and fill plot holes, remove boring bits, make a protagonist more likeable and add sexual tension. There are also new formats for novels that include a drone book, a holographic information crystal, an odourless glass and a T-shirt. But Gauld also pokes fun at science, pop culture and the human condition in this collection, bringing to light more than a few uncomfortable truths that will have readers shifting in their seats. In "Revolution!" a rabble-rouser encourages a crowd to smash the system, bring down the government, and march on Parliament demanding change. The crowd, however, wants change but is only willing to sign a petition. "Pass the pen!" Most of us are guilty of signing at least one e-petition on social media for the sake of change. Sadly, there are many more armchair activists than we care to admit. This collection is one sly, witty, sarcastic comic after another, and the humour is refreshingly British. Brimming with creativity, this book demonstrates how entertaining thinking outside the box can be. The reader might only be cautioned not to read this in public transit, as I did. There are plenty of unexpected laugh-out-loud moments. Minimalist stick men and women may remind us of our elementary school days, but these strips are very much for the thinking adult. This review has been cross-posted at the Montreal Review of Books. : Review: Baking With Kafka by Tom GauldTweet this!